Steve attempts to fell Eugene using “Fell Tree with Roots”. 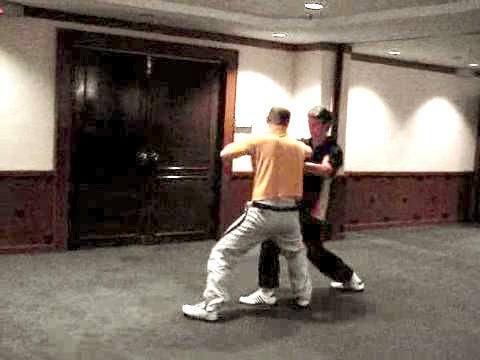 Eugene neutralizes the felling technique with a Unicorn Step and is about to push Steve away, as in Basic Combat Sequence 13. But Steve has a firm stance, and reverses the situation using a Unicorn Step. Eugene also uses another Unicorn Step to prevent Steve felling him. 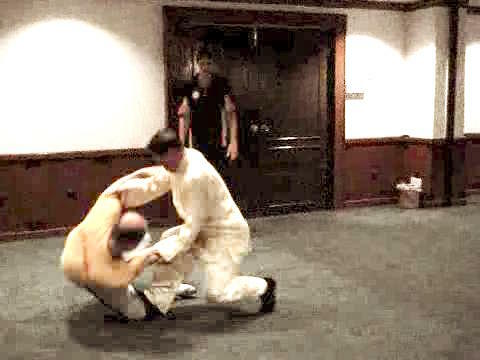 Grandmaster Wong demonstrates using a variation to fell and subdue Steve. Eugene practices the technique just shown by Grandmaster Wong. Notice that as Eugene turns to a Unicorn Step, he deflects Steve's right hand to prevent him from striking. Notice also that Eugene does not use brute strength to fell Steve, who is bigger in size. Can you see the fine movement Eugene employs to fell Steve? It is rotating his waist to off-balance Steve. In other words, the throw comes from the rotation of Eugene's waist and not from his hands. As Andy moves in to attempt a throw, Steve neutralizes the attack by moving into a Bow-Arrow Stance. Isn't it amazing that you can neutralize a throw merely by going into your stance? Steve also guards the opponent with one hand and drives a leopard fist into his ribs with the other hand. Steve tries to hold Andy and flick him over his head with his leg by going down on his back to execute an over-head throw. Andy neutralizes the attack using “Bar the Big Boss”, followed by an elbow strike using “Black Crow Flaps Wings”, and fells Steve on the ground instead. A good stance is necessary to implement the techniques effectively. Andy attempts to fell Steve with a low leg sweep, in a pattern called “Second Auntie Kicks Ball”. Steve neutralizes the attack with a skillful movement of the Unicorn Step, then fell Andy using the pattern “Fisherman Casts Net”. Here is another skillful use of the Unicorn Step. Andy applies “Second Auntie Kicks Ball” to sweep Steve's leg. Steve avoids the attack by using his Unicorn Step, then moves forward to fell Andy onto the ground and subdues him. The Unicorn Step is more combat functional than what you probably think. After neutralizing an opponent's low leg sweep, you can employ your Unicorn Step not only to fell him but also to break his leg. Be careful of not really breaking his leg when practicing with a partner. Wuji attempts to throw Alex over the shoulder with “Farmer Hoes Rice Field”. Alex responds with “Reverse Showing of Ox's Tail”, felling Wuji backward. It is amazing that when an opponent thinks he can throw you over his shoulder, he finds himself laying on the ground instead. 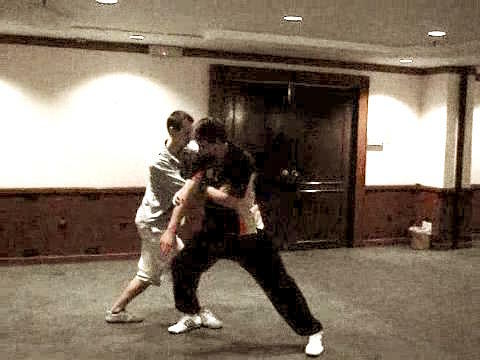 Alex attempts to fell Wuji using the pattern “Felling Tree with Roots” as in our Basic Combat Sequence 13. With an almost effortless twist, Wuji fell Alex instead, employing the pattern “Tame Tiger Listen to Wing” with an added step on Alex's leg from the pattern “White Crane Steps on Snow”. The size of the video clip is 0.48 mb. Felling Techniques using Stances in Shaolin Kungfu from Wong Kiew Kit on Vimeo.